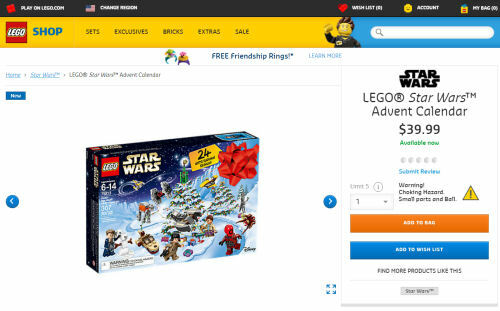 In a tradition that dates back to 2011, when the first LEGO Star Wars Advent Calendar was released, the latest addition to the line hit shelves on September 1st. Click on the screen cap below to jump to the LEGO shop@home page and scroll down to see the product description. Speed into the holidays with the 2018 LEGO Star Wars Advent Calendar! Open the doors of this galactic 75213 LEGO Star Wars Advent Calendar each day in December to discover themed LEGO minifigures, starships, vehicles and other collectibles. When you’ve opened all the doors, there’s even a foldout playmat with desert and ice-planet scenes for playing out epic Star Wars adventures. This great gift with 5 minifigures and 3 figures is the perfect way for fans of all ages to get ready for the holidays. LEGO Star Wars Advent calendar features 5 minifigures and 3 figures. Characters include Rose, Rowan, General Merrick, Battle Droid, Death Trooper, Rathtar, Guavian Security Soldier and an IG-88 droid. This set is not exclusive to LEGO and will start appearing at retailers in the very near future so if you're shopping outlet of choice differs to our you aren't limited. And if you aren't ready to buy this set yet you can still get in on the discussion and share your thoughts on this Star Wars collectible.